I just lost a game because I misread my opponent’s build. Although it is my fault for taking a chance, the animation of Twilight Council played a part to my defeat. I was playing against a Protoss on Bel shir Vestige. I used a 12/12 Reaper expand. Nothing special. 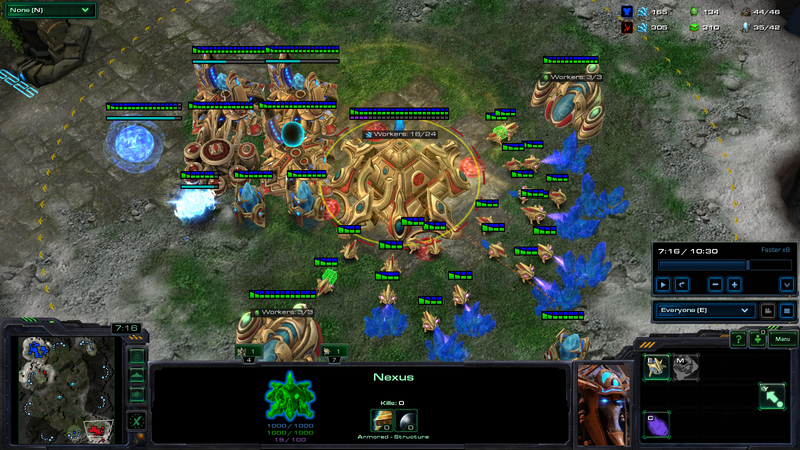 My Scv scouted 3 Probes on each geyser and two Pylons. I deduce that there is no proxy Stargate, as there are two Pylons. I then built an Engineering Bay at his/her natural since there is no Zealot. My Reaper scouted a Twilight Council and managed to kill a Probe. Everything seems to go my way. With that Twilight Council. it is very likely that a Blink All-in is coming. However, there is still a possibility that my opponent will play mind game and use Dark Templar since I scouted it. This is something that I had played against before, and it caught me off guard. I ran my Reaper into the main again after it had healed to scout if it was Blink or Dark Templar. I saw no Chronoboost on the Twilight Council, and deduce that it was not a Blink All-in. 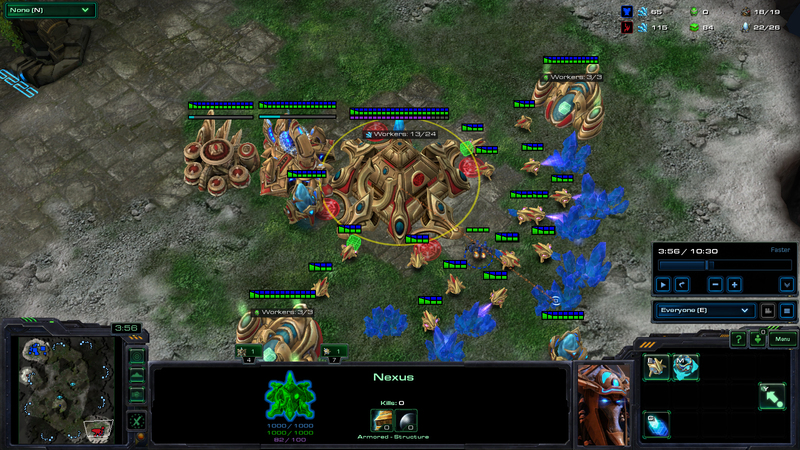 Then, I used my Reaper to scout around the base to look for the Dark Shrine. 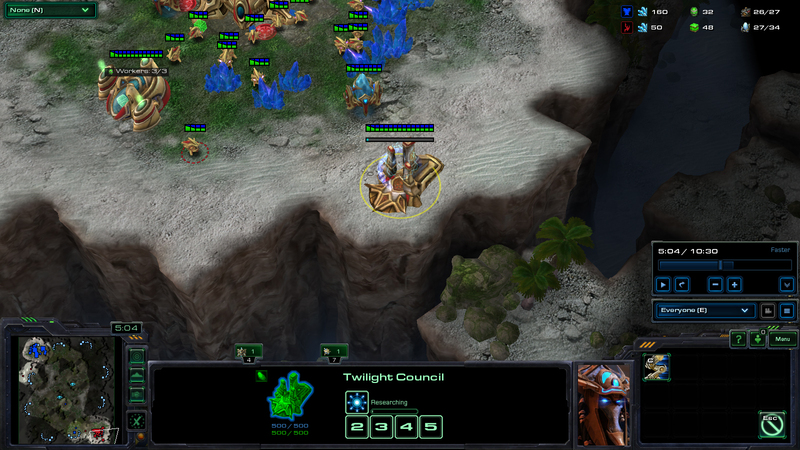 At the same time, I used a Scv to scout around the base for it too. I did not see a Dark Shrine in the base. I built an Engineering Bay at my base for Turrets instead of additional Bunkers. In the end, it was a Blink All-in and I lost. I reviewed the replay to learn why I didn’t see it coming. Look at images below. My opponent indeed used Chronoboost on the Twilight Council. My Reaper went in at the time when the Chronoboost was just over. S/he used Chronoboost on the Twilight Council again after my Reaper was not there. I threw down a scan when I have the energy as I still felt uneasy due to the information I had. It was too late for me to put down Bunkers. I decided to compare the difference in the animation of Twilight Council during research and standstill. This is to ensure I can tell that Blink is researching even though I don’t see the Chronoboost in the future. Actually there is a difference. 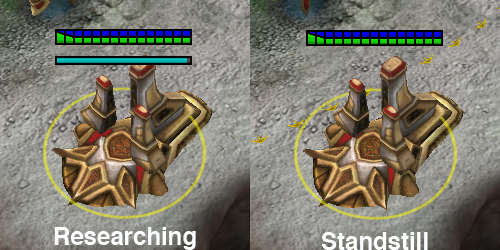 The two pillars at the side are more apart during research than they are during standstand. But the difference is very marginal. VERY marginal. I will definitely like to know if anyone has a good way to tell if Twilight Council is researching something when there is no Chronoboost. Please tell me in the comment. Stop flaming. If you don’t see a Dark Shrine and a lot of Stalkers behind a Twilight Council all that can happen to you is Blink Stalkers. End of the story. When did he even flame? Go troll somewhere else. Doesn’t it flicker? Or flicker faster when its researching something? Just took a look again. The light on the towers does flicker for both researching and standstill. The speed is slightly faster when it is researching than when it is standstill. But the difference is also really small that it is hard to tell the difference unless you put two side by side (at least for me). Really? Wow. I never know that and probably will never get to experience it. I am already playing with lag and delay on the lowest settings. Based on this, it seems like the two differences mentioned in the comments are true. 1. The two towers are slightly apart when researching. 2. The light on the towers moves slightly faster when researching. I use the light, i don’t think it is too hard to tell. Great. Now I know I do not just have inferior visual ability to spot Observers.